Baseluos Law Firm assists clients with their estate planning needs and guides them so their estate planning goals are met. Your goal is for your estate and beneficiaries to be taken care of. From basic to complex estate planning objectives and needs, BLF will work with you to choose the best tools for management of your estate. 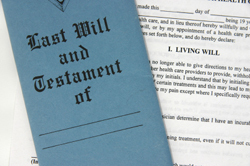 Drafting wills or powers of attorney for management of financial issues and health care often requires legal expertise. Too often, we are unprepared to meet our family's wishes for medical care. Should you or a member of your family become incapacitated, you need a Health Care directive. Baseluos Law Firm also offers trust services from basic to complex trusts, so that your assets are taken care of and ready for beneficiaries when needed. BLF can arrange a court-appointed guardianship to care for an adult incapacitated for whatever reason. Conservatorships can also be set up for adults and children not capable of their own estate management. Baseluos Law Firm also will work with you in setting up and organizing your estate correctly. We will handle appointment of executors and will contests, and will take your will through the probate process. Should a conflict arise related to your estate, BLF will use its litigation experience to resolve disputes either through litigation or mediation. If you would like a free consultation or more information about wills or estate planning options, contact the Baseluos Law Firm today to discuss your legal options.